"What should you say to someone you'd known your whole life but were just now meeting for the first time?" I seem to be reading a lot of "wow" books lately, and thankfully, this was one of them (though I didn't really have a doubt after Kirsty from Studio Reads told me she loved it). I had never read a review for this book before, or even the synopsis. I requested this book based entirely on the cover, and I'm happy to say that the novel lived to my expectations. It's been forever since I've read a dystopia novel, and the story's originality and quick plot made this an amazing read. Whenever I read books, I usually get hooked up on the romance, and while at the beginning, the same happened at this book, a few chapters in, it was obvious that the plot would be taking center stage, with the romance as something pleasant to fall back on. That was a nice surprise, considering how many books nowadays seem to focus more on shipping a couple than saving the world. Even so, I loved how the romance wasn't the insta-love type that easily sets my nerve on edge, but neither was it the 'I've loved you forever" type. The romance between Jaxon and Cate was the perfect backdrop for the story, and I absolutely loved how much it fit in with the overall story. I was honestly surprised of how quickly the plot went by. It went by so fast that as I'm trying to think about it, all I can imagine is a blur of events. Literally. Everything happened within a few short days, and yet no words were wasted. There wasn't a single time that I was bored, and that's saying something in today's world, where even the best of books can have you bored at one point or another. And another great thing about the book: there was never a boring part to the romance either! The ending was splendid; I couldn't have thought of a better one myself. Tht little twist with the clones was genius (like I said, never a dull moment). I did have a hard time believing that everyone survived what they did, and it was interesting how Jaxon always got better before Cate, but I'm so glad they did, because otherwise I would have DIED. The characters in the novel, they have so many faults, but it's nearly impossible not to love them all. 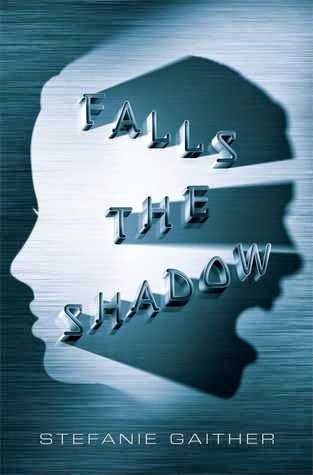 From memory - untrustworthy as it is - 'Falls the Shadow' is the best dystopia of the year. I had gotten a bit bored of the genre thanks to the piles and piles of dystopia novels released last year, but this book got me right out of my funk. It's a great story for people looking for a fast-paced thriller, and anyone in the mood for a guy and a girl saving the world. Book Synopsis: When Cate Benson was a kid, her sister, Violet, died. Two hours after the funeral, Cate’s family picked up Violet’s replacement. Like nothing had happened. Because Cate’s parents are among those who decided to give their children a sort of immortality—by cloning them at birth—which means this new Violet has the same smile. The same perfect face. Thanks to advancements in mind-uploading technology, she even has all of the same memories as the girl she replaced.